If you follow us on Twitter/Facebook, then you probably know that Sean just got back from a trip. 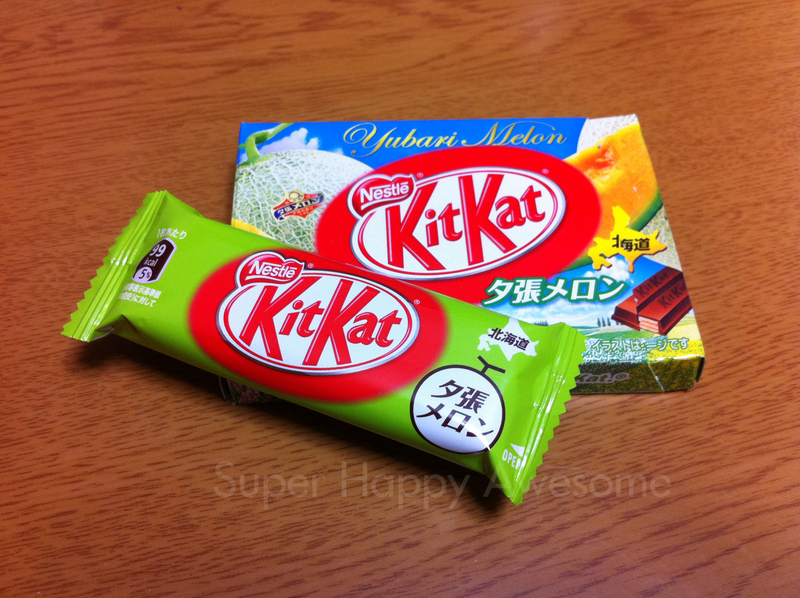 What you may not know is that he brought back these fabulous new Kit Kats–the Yubari Melon! Amusingly enough, he didn’t actually go to Hokkaido, but the airport these days seems to be stocking more and more crazy flavors, and he couldn’t miss out on these! 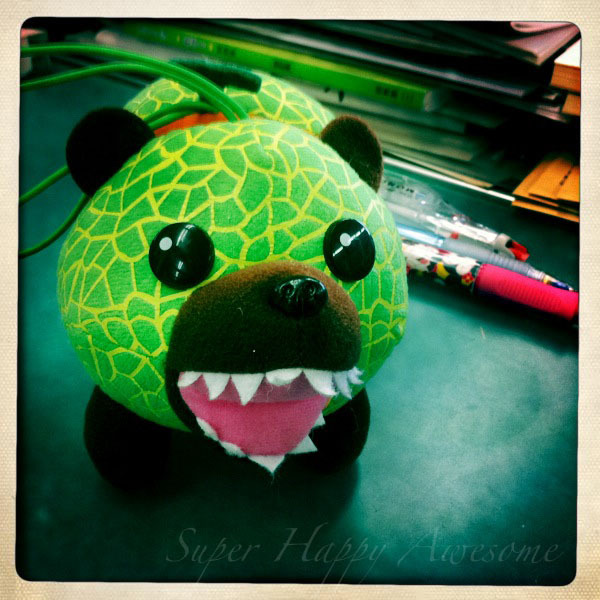 You may remember the Yubari Melon from my beloved Melon Bear, a favorite in the classroom (and my heart.) The Melon that he’s made out of is the Yubari Melon, which is quite often the ridiculously expensive melons that get on the news every now and then for their enormous prices. They’ve been known to go for thousands and even millions of yen, and I have to admit, I don’t really know what all the fuss is about. I mean, I’ve never had one of the really expensive ones, so maybe it tastes incredible, like sweet melony manna from heaven. But to me it kind of just seems like an overpriced cantaloupe. I know they’re supposed to be really sweet and fragrant, but…thousands of dollars? For a melon? Have any of you guys actually tried the really pricey ones to confirm if it’s worth it? Well, now you don’t have to worry about the ridiculously priced melons, and can taste their deliciousness in Kit Kat form! That’s because…it’s GIVEAWAY TIME! That’s right, one lucky blog reader will get a lovely Melon Flavored Kit Kat sent to them for their own tasting experience! Step 1: Comment on this post. If you tweet about it, or share it on Facebook, that’s awesome, (and if there’s a ton of response maybe I’ll pick an extra winner…?) but all you have to do to enter is comment on this post. Easy peasy! I’ll pick a winner at random and announce the lucky one on Sunday! This entry was posted in Giveaway!, Kit Kats! and tagged chocolate, free, give away, giveaway, Kit kat, melon, prize, sweet, Yubari melon. Bookmark the permalink. We tried to make Jeff Lee buy a musk melon in Japan but failed….but he did end up ponying up Y500 for an Aomori ringo. Oh, man, you guys totally should have gone for it! How was the apple? That’s more than we get in the States, at least! There it’s usually milk, dark, or white. Mayyyybe caramel! SO boring! Well, shoot. I’m game for a Kit-kat Kontest! A KitKat contest??? Sounds like the BEST CONTEST EVER!!! I get so jealous reading about your fancy kit kats! Haha, hurray! I’m thinking there should be many Kit Kat contests! Gotta share the joy! Yaaaaaaaaaay I would love to try these! I’ve tried wasabi, green tea, caramel and ginger ale Kit Kats so this would add to my flavor collection ^_^. Thanks for the opportunity! Those are some of my favorites! Wasabi is great, and gingerale was awesome! I love melon kit kat. I want it!!! It’s by far the best one ever. I really like it! I’m surprised, I didn’t think that I would! Those Kit Kats are wicked delicious! i’d absolutely loveee to try this! Really? I would have thought they’d have a bit of variety…you’re in Malaysia, right? I love great Kit-Kat flavors. Although it’s been a long time since I’ve had a Kit-Kat that wasn’t the regular flavor. Chocolate that tastes like melon? Sounds like it’s worth a try. It’s a strange combination, but I think it works! Ooh, sounds like you were over here last summer? Those were some pretty awesome flavors! I do love me some Kit Kat. Yay for giveaways! Hurray for giveaways, indeed! Btw, what part of the country are you in? Do you have any awesome local Kit Kats? Haha, I’d like to see a melon’s mother! I love your posts about crazy (by which I mean awesome) Japanese food. Makes me want to visit someday! I shall win this contest! Best of luck, good sir! 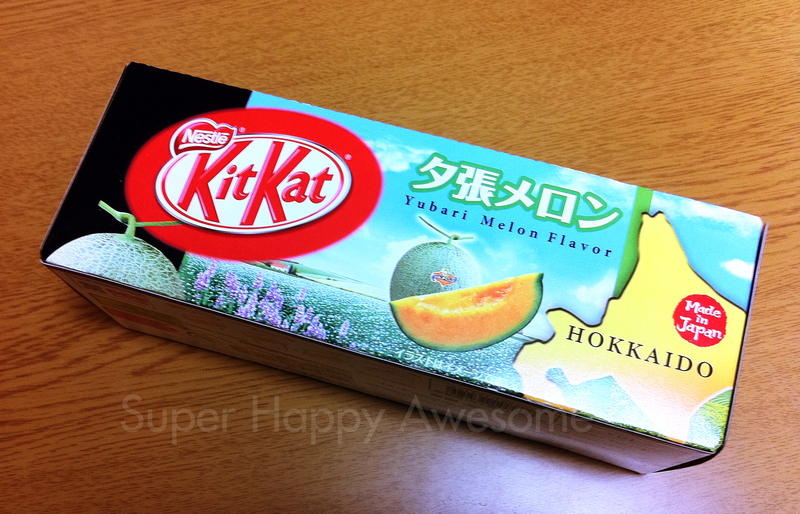 Ohhh, I haven’t tried a melon Kit Kat before. That would be wonderful if I was able to. I noticed when I left Japan in March, Narita Airport had way more snacks then anywhere else did. I guess they figured travelers were more likely to buy them? Yeah, I think they’re going for the travelers, since Japan is so big on Omiyage. They had tons of different Kit Kats, last time I was there! Kit Kats haven’t been the same for me since they stopped doing Cookies and Cream flavour. What a heady couple of months that was. I’m glad I found your blog entry. We just got back from Japan, and in the Sapporo (Chitose) airport, there was a display about melons, complete with a person inside a melon-bear suit taking photos with everyone! I wasn’t clear what kind of melon it was, but now I know!